Panchyat and Rural Development (PNRD) Admit Card/ Call Letter 2017-18. PNRD Gram Rozgar Sahayak Admit Card 2017-18 Download, MGNREGA Admit Card Assam Download. PNRD Computer Assistant Admit Card 2017 and 2018. PNRD was invited applications for 3787 posts on contractual basis on 14th August, 2017 against No.DRD-15/147/12/177 under Mahatma Gandhi National Rural Employment Guarantee Act (MGNREGA) and Pradhan Mantri Awas Yojana (Gramin). Here is some information we have collected for you. Panchyat and Rural Development (PNRD) Gram Rozgar Sahayak Admit Cards may be available on their official site www.rural.assam.gov.in and www.pnrdjobs.in when it is published. Candidates are requested to visit the official sites regularly for latest information. Panchyat and Rural Development (PNRD) Computer Assistant Admit Cards also may be available on their official site www.rural.assam.gov.in and www.pnrdjobs.in when it is published. Candidates are requested to visit the official sites regularly for latest information. Accredited Engineer and Gram Panchyat Coordinator Admit Card are published and it is available now. Candidates can download their admit cards from the official site of PNRD. For more about Accredited Engineer and Gram Panchyat Coordinator Admit Card candidates can check our post here. Account Assistant, District MIS Manager (MGNREGA) and Block MIS Manager may also available soon. Keep visit the official sites of PNRD Regularly. PNRD Admit Card for 945 posts against the advertisement No.PDDE(I) 10/2011/ Pt-I/105-111 dtd. 21st December/2017 has been fixed on Sunday the 20th May/ 2018. 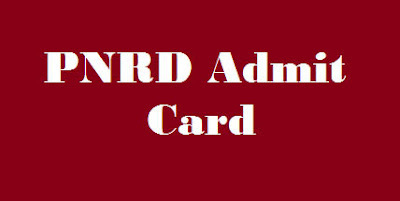 Admit Cards are available at www.pnrdassam.in.